Mac and Cheese, a MUST-try when you visit the US. Basically loaded with calories, containing macaroni pasta and a lot of cheeeeese. The basic version of that you can buy at any supermarket, which is really just a mix of macaroni and cheddar cheese to which you add boiled water..Et violà, there is your cliche American dinner. 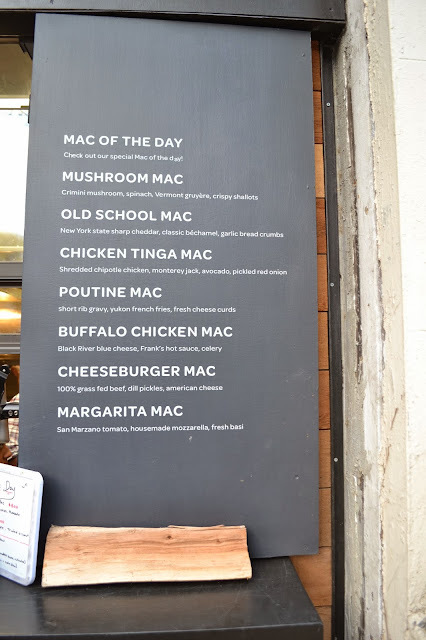 While having a walk in Brooklyn last Saturday I discovered that nice place called 'Elbow Room' on Flatbush Ave serving Mac & Cheese, with some more ingredients than what the name indicates. The weather was still nice, so we could sit outside while enjoying our Mac & Cheese. Type of Place: 'Elbow Room' on Flatbush Ave is a takeout restaurant serving Mac n' Cheese varieties. It is connected to 'Morgan's BBQ' a restaurant with burgers, lots of meat and other Texas-BBQ-style dishes. The restaurant itself looks very 'hipsterish', with a nice bar in the middle, and many wooden tables all around the restaurant. You can also sit outside on some kind of ale-benches. Food: 'Elbow Room' serves Mac n' Cheese with many different nice ingredients. We had the one with Gruyere cheese, spinach, mushrooms and crispy shallots. This was just delicious! They weren't cheap with the ingredients - a lot of spinach, which tasted very fresh and really like spinach, and not just some weird green thing, which found its way inside my food straight from the freezer.. and same with the mushrooms, they were really delicious and still tasting fresh, even though being surrounded by all the cheese. Now the most important part of the meal, the macaroni and the cheese - both was good! The cheese was maybe not AS good as the Gruyere you would get in Switzerland, but tasty anyways, especially when you consider the price, which was $9 for our choice of Mac n' Cheese. Other kinds were for example the 'Poutine Mac' with short rib gravy, yukon french fries and fresh cheese curds, or the 'Chicken Tinga Mac' with shredded chipotle chicken, monterey jack, avocado and pickled red onion...I could go on, but you can as well check their menu here --> Menu Elbow Room. A cherry on top is the Mac of the day, which is obviously changing every day. This takeout place was only selling Mac n' Cheese. If you look for more, their restaurant in Barclay's Center serves even more kinds of Mac n' Cheese, but also salads and other dishes. Price: The prices are low, $6-9 for a portion of Mac n' Cheese is a good deal!